John Lennon’s application for permanent US residence was seized by the FBI this week, in a “raid” on a New York auction house. 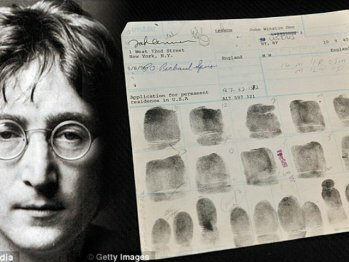 The 1976 immigration document, which included Lennon’s signature and fingerprints, was expected to sell for at least $100,000 (£62,621), according to the dealer. “I don’t know why it was so important that they had to have it back,” Pete Siegel said. Just a week ago, Siegel added a photograph of the cardboard form to the ‘Gotta Have Rock and Roll’ auction catalogue. Within days, the FBI called and asked if they could “inspect the card”. “We said, ‘Sure, come in,'” Siegel said. Officials from both the FBI and the US department of homeland security appeared at the Manhattan gallery, citing a mysterious “ongoing investigation”. Wednesday morning, they reappeared with a subpoena and seized the card. The card was being auctioned on consignment, by an unnamed owner who allegedly bought it at a convention 20 years ago. Some have raised the possibility that the item was stolen: according to Lennon’s former lawyer, Leon Wildes, some of the late Beatle’s papers, including a fingerprint form, were stolen in 1976. Not long before, Lennon had been under investigation by the FBI for his anti-war activism. A similar fingerprint card was sold at auction in 1991, without any interruption from the FBI. Officials at Sotheby’s said it was not the “official document”, but an “extra copy” autographed for a policeman. It sold for $4,125 (£2,598).